This story was recently sent in by BY SEAN GRAY (author). The following article is from his post in Fire Engineering Magazine, check it here. THIS IS A MOMENT MOST OF US envision from the time we start recruit academy-the time we hope all of our training will come to fruition and our bodies will be able to perform what our minds are telling us to do. Most of us may never get a chance to be part of a situation like this. I am proud to write about a career-changing event that was 17 years in the making for me and may not ever happen again. At around 0200 hours, Cobb County (GA) Fire and Emergency Services Company 19-A was dispatched to a possible townhome fire. In the initial report, there were no significant reports of any persons trapped or multiple calls from neighbors indicating this would be a working fire. The dispatcher reported, “The caller stated, ‘My house is on fire,’ and hung up the phone.” We’ve all been dispatched to a call similar to this one, and it turned out to be nothing. As we approached the entrance to the subdivision, a person in the roadway was flagging us down. This is usually a good sign of a working fire. The flagger told us that his house, at the end of the street, was on fire. We arrived on scene to find the end unit of a six-unit, two-story townhome with flames venting out of two windows on the A side, first floor. Our truck officer assumed incident command while the truck crew went to the front door to force entry for the fire attack crew and then was assigned search and rescue by the incident commander (IC). The fire attack crew entered through the A side front to extinguish what appeared to be a kitchen fire. The search crew entered immediately after the hoseline and started searching for the stairs leading to the bedrooms. There were no indications of any victims prior to entering the structure. No cars were in the driveway, and the flagger had not mentioned that someone was still inside. However, staying true to our training, since it was 0200 hours and there is always a chance of a possible victim, we performed our search on the first floor in moderate smoke and heat conditions. We passed the fire room to our left and found the stairs on our right (photo 1). The stairs were approximately 10 feet inside the front door. Because of the time of day, we chose to proceed upstairs toward the bedrooms. If there was going to be a victim, this would be where we were likely to find him. As we climbed the stairs, we were met with zero-visibility conditions and elevated temperatures. We dropped to the floor and started crawling. As the search crew leader, I followed in the rear using the thermal imaging camera (TIC) and maintaining constant verbal contact with the two firefighters who were searching. The lead firefighter found a victim unconscious on the stairs. As I attempted to make the call on the radio, we were met with heavy radio traffic from the second-due engine, which was attempting to locate a hydrant. I wasn’t able to communicate to command that we had found a victim, but we couldn’t waste time attempting to make the call on the radio. When you’re not expecting to find a victim, you’re caught off guard when you find one! The victim was lying face down with his head on the landing and feet upward in the stairwell. We found it difficult to move him. Three firefighters in full gear were all trying to grab and pull in an unorganized effort. As our adrenaline took over, we pushed and pulled the victim to the bottom of the stairs in a bundled-up mess. We quickly regained our composure and developed a more organized plan for victim removal. Most of us in the fire service have lifted an unconscious person from a bathroom floor on emergency medical service calls. We typically grab underneath the person’s arms from behind and start dragging the person to a place where the paramedics can start working on him. This can be tough even in the best of conditions with perfect visibility and no heat. The problem is that the patient usually falls through your arms like a slippery noodle. The same thing happens in fires. To make matters worse, we had on full turnout gear with self-contained breathing apparatus and were in a superheated, low-visibility environment. The victim slid right out of our arms after we made a couple of attempts to drag him from behind. This was when we soon realized that removing a 240-pound half-naked unconscious victim was not as easy as we had been shown in training drills. After all of the rapid intervention team and firefighter-removal training exercises we had conducted, the Training Minutes videos we watched on fireengineering.com, and the victim-removal drags we learned, we were still at a loss. Nothing worked. I have carried webbing in my gear for 15 years because a mentor had shown me what he carried in his pockets. So I copied him and assumed I was prepared to use it. Not so. Through my years of experience and training, I felt as if I had mentally prepared for this event, having run so many scenarios through my head many times. However, this wasn’t the case. All we could focus on was getting this guy out of the immediately dangerous to life or health environment as quickly as possible. Something we don’t typically train for is pulling out civilians. Our training dummies have handles and turnout gear in place, but that isn’t very realistic. Unconscious civilians don’t have handles attached to them-or clothes, for that matter-at 2 o’clock in the morning. After a couple of futile lift attempts, two of us grabbed the victim’s wrists and pulled while the other firefighter pushed at the victim’s legs. We were finally moving, and out we came through the front door. We dragged him down the front steps into the driveway and placed him at the command post on the A side. The fire attack crew followed us out and immediately went to work on the victim. The engine pump operator retrieved the advanced life support (ALS) equipment. The victim was unresponsive with agonal respirations. Possible Second Victim in Vicinity of First Victim? While the engine crew started to revive the patient with assistance from ALS Rescue 5’s crew, we reentered the structure and went back to the place where we had found the victim. An afterthought from the lead firefighter was that he wished he would have initially searched the area immediately around the victim for a second victim (i.e., infant/small child). There was NO second victim. Although the landing area was very small, this was a lesson learned: Check for secondary victims in the nearby vicinity of the initial victim. Once we made it back to the landing, we went back up the stairs, again in zero-visibility conditions. We discovered a bedroom immediately to the left. Prior to entering, we came up with a quick search plan: classic oriented search with the TIC, just as we had trained on in the past. One person would stay at the room’s entrance with the TIC and the other two would search the voids not seen by the TIC. A TIC can be a valuable tool, but do not rely on it for a complete search. You must physically search the areas you cannot see. The TIC also provides the crew leader with a tool to help maintain crew accountability. Since we knew the fire attack crew had knocked down the fire, we decided to horizontally ventilate by breaking out the windows as we located them. This took time away from our search, but it provided fresh air and better visibility, which in turn sped up our search. We did this with careful consideration, knowing that there were no ventilation efforts in place or on the way. We quickly learned another valuable lesson while breaking a few of the windows for ventilation as we were met with disgruntled voices from those working on the victim in the driveway: Position the victim far enough away from the building so that, when ventilating a window, glass will not fall on the victim and those medically treating him. After clearing that room, we moved on to the next bedroom and bathroom and stayed with the oriented search plan. I crawled in first and went down the left wall, spreading out to cover as much of the room as possible. I heard a noise, maybe a voice or a groan of some type. I stopped, called out, and reached for the bed. I felt nothing on the bed. As I continued to search the room, I slammed into a television that was ON. I realized at that moment I had mistaken the TV for the voice of a victim. I felt like an idiot. After moving past the TV, I came to the window and ventilated. The smoke quickly lifted, and we were able to get back on our feet and quickly complete the primary search. After completing the primary search, one of the firefighters wanted to go back to search one of the rooms again. He has an eight-year-old daughter and realized that the occupant of the room we had previously searched was a young girl. Knowing we hadn’t seen a young girl outside, he wanted to check the room again. We found nothing but stuffed animals and Justin Bieber posters. Luckily, the little girl who normally sleeps in this room was spending the night with a friend. This was an emotional moment for all of us on the fireground; the thought of her possibly being in there really hit home with the firefighters who had young children. All of us had been assigned as a search crew in the past; however, it’s easy to become complacent when you have never found a victim before. We later discovered that the guy waving us down in the street was the teenage son of the victim we found. 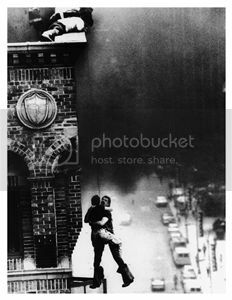 He was able to self-extricate from the burning home and run down the street to flag us down. It would have been nice if he had told us that his father was still inside the home, but this is just another example of why we should never take the possibility of savable victims for granted. As an engine/truck company that takes pride in our work, we beat ourselves up over this incident. Things had gone great in the eyes of our chief, and we had saved a civilian. But from our perspective, we felt as if there was more to learn from this incident. We obtained several abandoned structures and created training drills to share our mistakes and provide a lessons-learned approach to this incident. We didn’t want others to have the same problems we had. So, we replicated the event and practiced victim-removal techniques (photos 2-5). 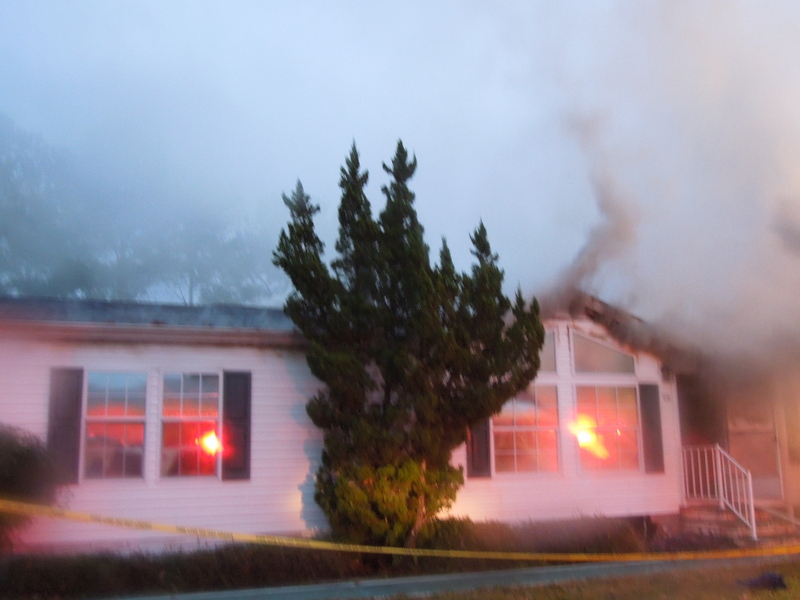 This fire was a great learning experience for everyone on the fireground that night. Tactically, the fire went very well. All of the tasks were completed in a timely manner. This entire incident was under control in less than 10 minutes. It was handled by one engine and one truck, eight firefighting personnel, along with two personnel from an ALS rescue. ALS Rescue 5 reported that the victim had become combative after resuscitation and was talking prior to ambulance transport. The victim made a full recovery and was released from the hospital a few days later. Stay alert, and always be ready. Assume that you’re going to find a victim every time until proven otherwise. Stay focused on the task at hand. It’s never too late in your career to continue learning. Be a student of the fire service. GO TRAIN! Special thanks to Firefighters Chris Baines, Reggie Jenkins, and the other crew members of Cobb County Fire Stations 19 and 5 involved in this call for making this a seamless civilian rescue. In spite of the points made in this article, the incident went very well and is a great example of teamwork. ● SEAN GRAY is a 20-year veteran of and a fire engineer with Cobb County (GA) Fire and Emergency Services Station 19-A shift. He has an associate degree and is working toward a bachelor’s degree in fire safety engineering. He has taught at FDIC and has been published in Fire Engineering. Firefighters have saved a Hamilton woman’s life in a dramatic rescue at a two-storey home on Gage Avenue. 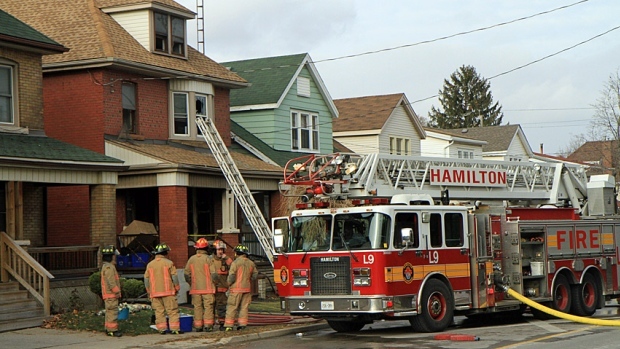 Hamilton firefighters arrived at 58 Gage Ave. S. just before noon Thursday after reports of a fire. Hearing that someone was still inside, three firefighters went into the house and crept blindly through the basement to rescue a 53-year-old woman trapped there, says Claudio Mostacci, public information officer with the Hamilton Fire Department. The fire was intense, Mostacci said. In situations like that, firefighters are creeping through smoke so thick can barely see in front of their faces. The heat was intense and draining — so severe —Mostacci said, that initial reports said they were injured. The fire climbed the walls around them. By the time they entered the basement, the flames had spread to the first floor, and the basement ceiling was on the verge of collapsing. “People wouldn’t believe what those guys went through today to get in there,” Mostacci said. About 30 firefighters responded to the fire. When the first crews arrived, the woman’s two daughters were in the front yard, and told the crews that their mom was still in the basement. A captain and two other firefighters went into the house to do search and rescue, Mostacci said. They groped though smoke and intense heat to find the woman. Ten minutes later, they carried her out. The Office of the Ontario Fire Marshal is investigating. The home is essentially destroyed, suffering around $300,000 in damage. The woman had no vital signs when she was pulled from the home, said Det. Const. Greg Slack of Hamilton Police Service. Emergency crews revived her and she is now in hospital in critical condition. Neighbour Les Dykstra lives a couple of houses away. He was asleep when the fire broke out. He said he knows the family enough to wave and say hello. Shreveport police and firefighters rescued three children from a burning home in the Caddo Heights neighborhood Thursday morning. 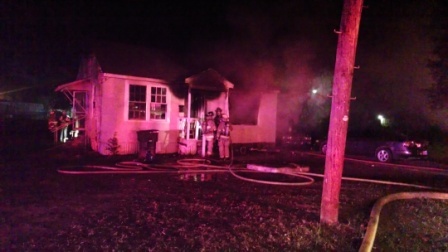 Shreveport firefighters responded to a report of a fire just before 12:10 a.m. at a home in the 5200 block of Kent Avenue. When firefighters arrived, police were at the scene working to get an adult and five children ranging in ages two to six out of the burning home. 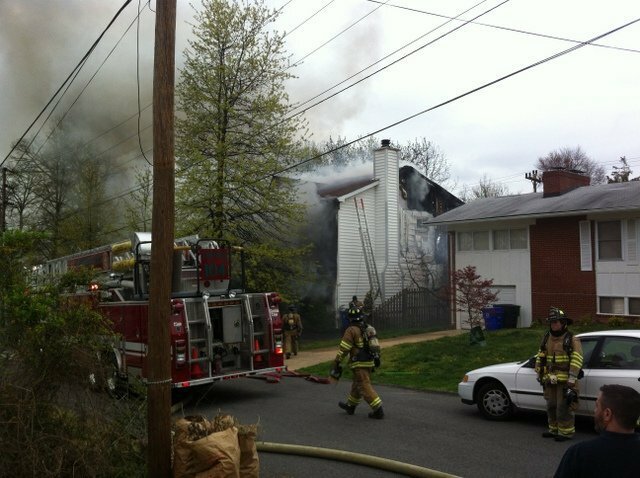 Flames and smoke were pouring from the home. An adult and two of the five children were able to escape the fire. Police officers Zack Johnson, Jeremy Jordan and Sgt. Steven Plunkett were able to get two more of the five children out of the home after breaking out a window. Firefighters moved in to rescue the final child from the home. The three children that were rescued were taken to University Health with various degrees of burns. “But I say thank ya’ll so much because I couldn’t do it I couldn’t be ya’ll, I’m just thankful the kids got out safe,” said neighbor and friend Stenesha Oneal. The Red Cross says contributions to the family can be made directly through the Red Cross located at 805 Brook Hollow Street in Shreveport. KANSAS CITY, Mo. 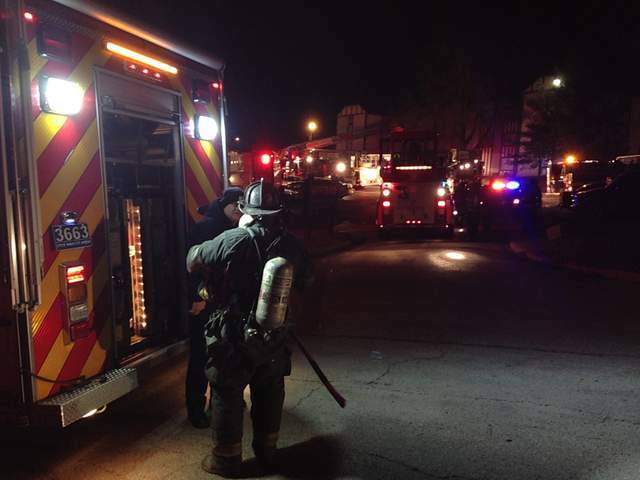 – Firefighters worked to rescue people trapped inside a burning apartment building near E. 85th Terrance and Blue Ridge Boulevard in Kansas City, Mo. According to Deputy Fire Chief Vince Voucher, 12 people had be be rescued from the burning Stonewood Apartment building. Firefighters put up ladders to the balconies for people to climb down. Others had to be rescued by firefighters who went into the building. Some residents jumped from the apartment balconies, but were not hurt. Only one unit of the apartment complex was damaged, but several others have smoke damage. 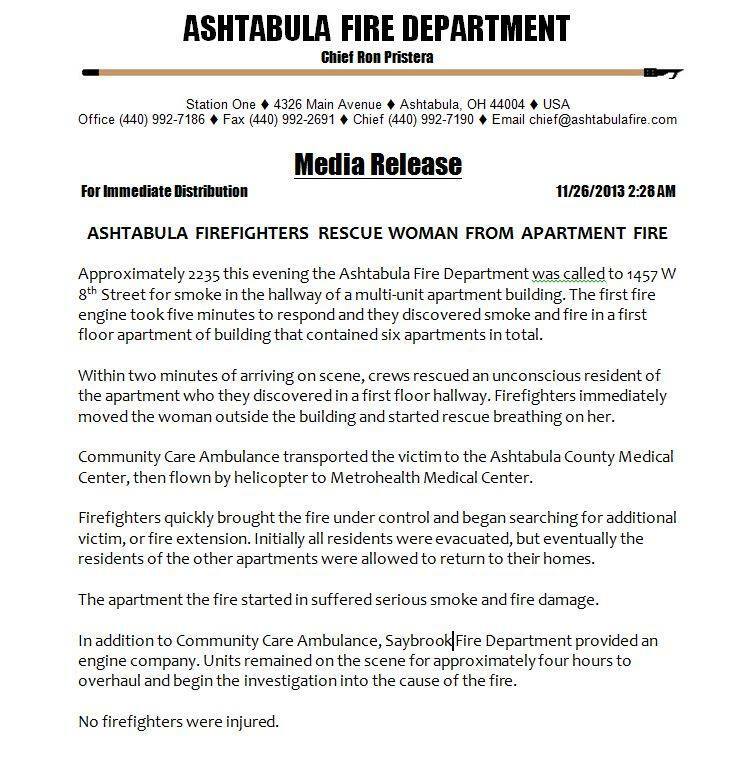 The only woman on the phone with dispatch hid in the closet from the fire and stayed on the phone with them until a firefighter pulled her out. A neighbor brought over blankets and coats to keep people warm after he said he hear screaming and crackling wood. The Red Cross is providing meals and clothes for 28 people affected. 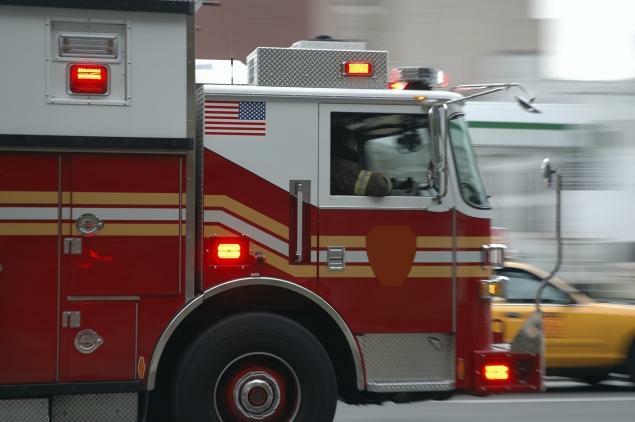 A raging fire at a Bronx housing project left an elderly man critically hurt and a firefighter with minor injuries Sunday, officials said. The blaze began inside a second-floor apartment on W. Tremont Ave. at the Sedgwick Houses in Morris Heights about 12:30 p.m., officials said. It took 60 firefighters less than an hour to snuff out the fire, which was contained to just the apartment, officials said. The smoke-eaters rescued an 81-year-old man from inside the burning apartment and rushed him to Harlem Hospital with severe burns to his body, officials said. A firefighter was also treated at Harlem Hospital, officials said. Fire officials were investigating the cause of the blaze. FLINT, MI — Firefighters rescued a 54-year-old man from a burning home early Wednesday morning, according to the battalion chief. The fire started in the first floor living room area at a home in the 3800 block of Beachwood Avenue near Center Road, said Battalion Chief Darren Clemons. Firefighters made entry to the home and found the man in the basement, he said. The man was conscious and was taken to the hospital for minor burns and smoke inhalation. He was listed in stable condition, Clemons said. There was heavy damage to the front of the home, Clemons said. The cause of the fire is unknown. Zachary firefighters rescued a man from a burning mobile home in the early hours of Thanksgiving Day, Zachary Fire Department Chief Danny Kimble said. Firefighters responded to reports of smoke coming from the mobile home in Sweet Briar Mobile Home Park on Samuels Road shortly before 2:30 a.m. When they entered the home, they found a 58-year-old man on the floor and pulled him to safety, Kimble said. Paramedics took the man to Baton Rouge General Mid City. “The flames are coming from the back of the house,” said Radic. During the 9-1-1 call Radic said his wife and their dog managed to get out of the house, but he was still inside the home while on the phone with the 9-1-1 dispatcher. “Where are you at inside the house,” asked the dispatcher. “Right now I am in the bedroom trying to get dressed,” said Radic. “Don’t worry about getting dressed. I need you to get out of the house,” said the dispatcher. But Radic stayed trapped inside, while flames ripped through the home. When Marion County fire fighters arrived, they immediately searched for Radic. “They found the 75- year -old man unconscious. They removed him from the home. They were able to rescue him and immediately started treated and transported to Ocala Regional Medical Center,” said Jessica Greene who is the Marion County Fire Rescue Public Information Officer….